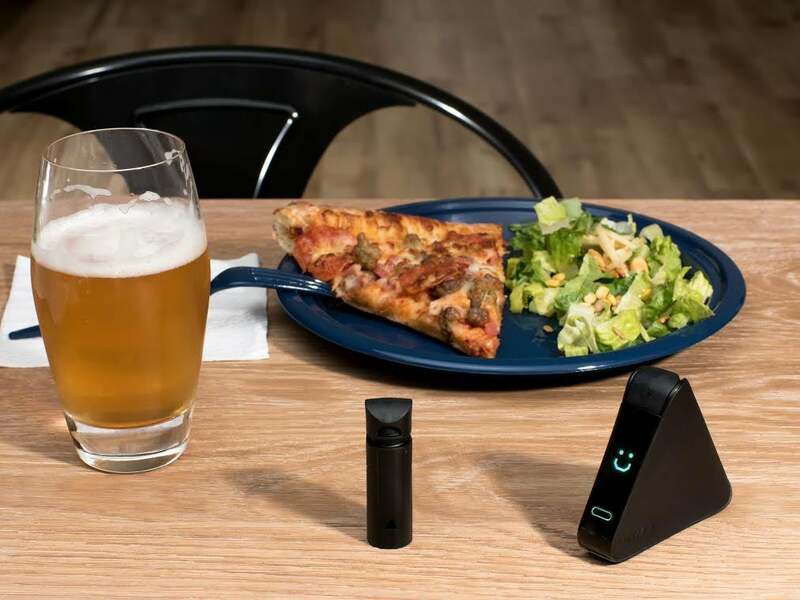 Available for pre-order later this month, Nima is a small, portable sensor that consumers can use to quickly detect whether the food in front of them contains gluten. The product is the first for San Francisco-based 6SensorLabs, which was founded two years ago by Massachusetts Institute of Technology alums Shireen Yates and Scott Sundvor. The idea was inspired by their own experiences with food allergies and sensitivities. The key to Nima is its speed. Yates says that existing tests on the market take up to 15 or 20 minutes to give an uneasy diner a definitive answer. Nima takes two minutes. "A lot of the innovation was [asking ourselves] how do we make this fast enough so we can put it in the hands of consumers," she says. All a user has to do is place a sample of the food into a disposable, one-time use capsule and close it with a cap. They then place the little capsule into the sensor and turn it on with the push of a button. If the food does contain gluten, a little blue sad face will pop up on Nima's display. If it's gluten-free, you'll see a happy face. The sensor will detect if the food contains at least 20 parts per million of the gluten protein, in adherence with the FDA's requirement that gluten-free food contain less than 20 parts per million. Related: A Gadget That Detects Gluten? With $4 Million in Funding, This Startup Is Working on It. Yates said she has been pleased with the reception thus far. "I take it pretty much wherever I go out to eat. It's been really great to see people react to it. [The reaction's] been really positive. It's like a novelty, people are really excited and wait staff are really receptive." A Nima starter kit, with the sensor and three one-time use capsules can be pre-ordered at a discounted price of $179 starting Oct. 20 on the 6SensorLabs website. After the first five days, the price will increase to $199 until pre-orders are exhausted. During the pre-order time, 12 packs of those disposable capsules will be priced at $47.95. The device will retail for $249 at full price. While the kits will only be available to purchase on the site for the time being, Yates says "eventually we do want to be in retail, but just to start, we want to keep total control over the brand, keep an efficient way of getting it into the hands of consumers. We ask people all the time, if this existed in a store, where would you want it? [They tell us] Target, Walgreens, Whole Foods." Yates, Sundvor and their team of 15 are also hard at work on an app that will be released with the device, but will be accessible without purchase of a kit. On the app, users will find current information about whether a restaurant is allergy-friendly and the knowledgeability of the staff down to whether to avoid a specific item on the menu or, if there is a gluten-free or allergy-free option, how good it actually tastes. So what's next for 6SensorLabs? Looking ahead, tests for peanuts and dairy are next in the queue, followed by other food groups that cause reactions, such as shellfish. Yates and Sundvor are also thinking about tests for additives, GMOs, preservatives and bacteria that causes food poisoning. They are also considering a certification program for restaurants and food manufacturers to be designated as friendly to individuals with food allergies and sensitivities. Ultimately Yates says her company's mission is about food transparency. "It's food transparency beyond this first protein we are looking at, helping anyone who wants to know what's in their food and how to best nourish themselves."